Ruminations on religion, music, books, and of course Paganism by Jason Mankey. As someone with a keen interest in the origins of Christianity I've been keeping up with the developments in the trial of Israeli Antiquities Collector and Dealer Oded Golan. 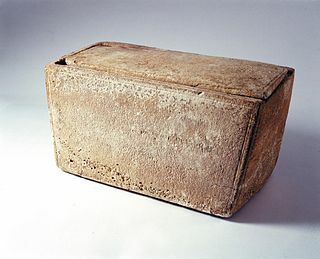 Golan is best known for bringing attention to the alleged ossuary (bone box) of St. James, the brother of Jesus, a box that most in the scientific community think is a forgery. Seven years ago Golan was charged with forgery; today he was acquitted of those charges, unfortunately that verdict has been reported with very little context. The Golan case has been featured on programs like 60 Minutes, and in various magazines and cable programs. The sensationalism around the ossuary can be attributed to three words that appear at the end of the inscription on the ossuary "brother of Jesus." Believers in the authenticity of the bone box have the messed up belief that the words "brother of Jesus" proves something, generally that Jesus was a historical personage, and then through a leap of logic totally unrelated to the ossuary, that Jesus was the Son of God. Ossuaries were commonly used by Jews living in Israel during the Second Temple Period. The practice was discontinued when the Second Temple was destroyed in 70 CE. Jewish burial customs during this period generally called for dead bodies to be laid in a cave for a year, and then moved into an ossuary afterwards, when all the soft tissues had decomposed. Since the practice was popular, and ossuaries were made of stone, thousands of them survive to this day, some people in Israel even use them as flower boxes. An ossuary is not a rare archeological find, what makes the James Ossuary unique is the inscription, or inscriptions. One part of the inscription on the James Ossuary is beyond reproach. That part of the inscription reads "James, Son of Joseph." The words "James, Son of Joseph" mean very little on their own, those names were extremely common during the time of Jesus. It would almost be like finding a gravestone that said "Jason, Son of Michael," those two names are so common that they provide little insight into anything. Jesus was also a very common name two thousand years ago, and it's not outside the statistical realm of probability that there were several people in the Holy Land with a Joseph for a dad and a James for a brother. The second part of the inscription on the James Ossuary, the "brother of Jesus" part comes from an additional hand. Even scholars who believe in the complete authenticity of the box agree with this, their argument is just that the inscription occurred shortly after the original one. The inscriptions on ossuaries were very brief, and generally didn't include statements beyond "Douglas, Son of Fredrick," the listing of a brother on the James Ossuary is extremely unique. Believers who are attempting to use the ossuary as a tool for converting souls argue that the extra inscription was added because Jesus was unique in history. That's not a completely unreasonable argument, but James, and his followers in Jerusalem, were also pious Jews. It just seems unlikely that they would have bucked convention, they did all follow Jewish Law for example. They didn't see Jesus as the Messiah preached about by Christians today, they most certainly saw him as a Jewish Prophet, and someone who was a part of Judaism, not someone out to create a new faith. So it seems odd to me that those individuals would have added the "brother of Jesus" tag to the ossuary, it doesn't feel consistent with how they would have acted two thousand years ago. The inscription is also written in Aramaic, which is extremely problematic. Both Jesus and James would have spoken Aramaic, no question about that, but ossuary inscriptions were generally written in Hebrew. If James, brother of Jesus, died in Jerusalem (likely), this would have most certainly been the case. It's not outside the realm of possibility for the inscription to have been written in Aramaic, just unlikely. Most scholars believe that the "brother of Jesus" part of the ossuary is a modern addition, probably an addition by Golan, or one of his associates. Golan has (allegedly) associated with Egyptian forgers in the past (for the record those alleged associates refused to testify at his trial). I think it's likely that they added the inscription to his, legitimately old and inscribed with "James, Son of Joseph," ossuary. I'm not smart enough to describe the ins and outs of the inscription forgery business, but most experts argue that the patinas on the two parts of the inscription are obviously different. In addition to the patina issue, the "brother of Jesus" inscription has various other problems which are absent from the "James/Joseph" inscription. Words are spelled incorrectly, the letters are not of consistent size, and the letters are not in a straight line (they are in the other part of the inscription). This all argues against the authenticity of the Jesus line. If the "brother of Jesus" inscription is legitimately old, it might still be a forgery, perhaps one from the second to fourth centuries. "Christian relics" were in large demand by then, this would have been an easy one to create. Ossuaries, since they are made of stone, are impossible to date. The only way to date an ossuary is by the inscription placed upon on it, and that only dates the inscription. The actual ossuary could be hundreds of years older than the inscription, especially if the inscription is a forged one. So even if the inscription was not made by Golan or his associates, it's impossible to date to the time of James or Jesus, there are too many variables. One of the things that today's verdict did not do is prove the authenticity of the James Ossuary. In his ruling the judge involved with the case wrote "This is not to say that the inscription on the ossuary is true and authentic and was written 2,000 years ago, . . . . .We can expect this matter to continue to be researched in the archaeological and scientific worlds and only the future will tell. Moreover, it has not been proved in any way that the words ‘brother of Jesus’ definitely refer to the Jesus who appears in Christian writings." I'm always baffled why people get so caught up in these arguments to begin with. While there's nothing in the archeological record confirming the actual existence of Jesus of Nazareth, most scholars believe that Jesus was a historical person. Yes, there are some rather rabid atheists who will argue otherwise, but it shouldn't be surprising that a Jewish peasant from two thousand years ago died without a paper trail. The complete authenticity of the James Ossuary then proves very little. Due to the common occurrence of all three names, naysayers could easily dismiss the box even if the inscription was beyond reproach. For Christians who want to use the ossuary to prove the divine nature of Jesus, good luck, if anything the box (if authentic) speaks to the ordinariness of Jesus. If my brother was the Son of God I'd expect a little something extra at my burial (or reburial). While the New Testament is populated by historical figures (much like Celtic Mythology and the Iliad), the divine nature of those figures always comes down to faith. A bone box doesn't prove the holiness of anyone, not does it discount that holiness. Understanding the context in which a faith arises is a worthy enterprise (and in my mind, makes the experience of that faith more meaningful), but by their very nature, historical details can't prove the supernatural. At the end of the day, you either believe or you don't, and no amount of Aramaic inscriptions, authentic or forged, should change that. Halloween Traditions . . . . .
Black Sabbath, The Occult, and the Origins of the Devil in Heavy Metal. Happy Holidays, Merry Christmas, or Blessed Yule-Whatever Floats Your Boat. Most Influential People in the Rebirth of Paganism and Witchcraft. Jason Mankey. Watermark theme. Powered by Blogger.